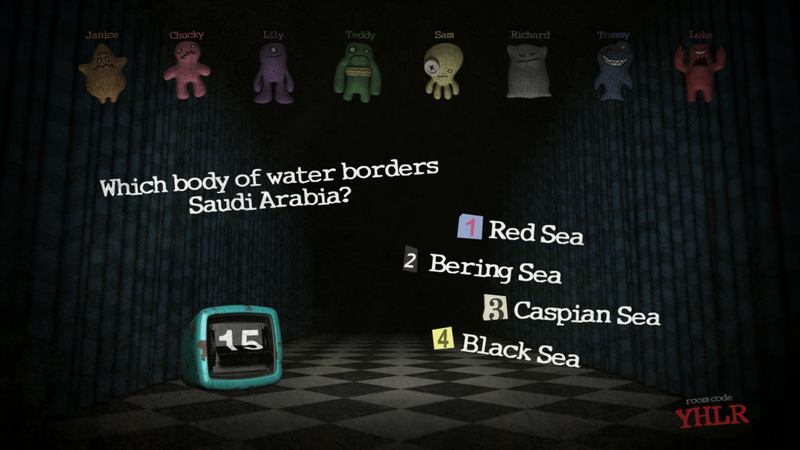 Trivia Murder Party 2 will be bringing its hilarious exploits to Jackbox Party Pack 6 later this fall. The Jackbox Party Pack is always full of hilarious times for anyone who gets involved, and Trivia Murder Party 2 is coming to make it rain...blood, probably. The game centers around trivia, of course (as you probably already guessed) where if you answer the question wrong, you have to fight for your life against a serial killer with various different mini-games. According to Jackbox, a sequel to Trivia Murder Party is the most-requested of them all, and it's finally coming as of Party Pack 6. Jackbox broke the news in a recent blog post, where the game was detailed a bit further. It's poised to include new questions, additional mini games, cursed "gifts," "weird" new ways to die, and better audience features. The post also teased at other additions to the game, including "keys, mirrors, wigs, swords, daddy issues, and fun." That doesn't mean anything to us (they're meant to be cryptic, after all) but perhaps all will be revealed very soon. Jackbox also confirmed that the serial killer has moved back into his childhood home for this entry, which happens to be a lovely little place called a Murder Hotel that his family has run and killed people in for generations. The Jackbox Party Pack 6 is coming this fall 2019 to PC, consoles, and digital platforms, with additional information about what to expect from the game on the way.